You can view the differences between two files by comparing them. You can compare different files, you can compare versions in the Workbench with versions in the repository, or with the local edit history. In some cases you can compare three files (when a common ancestor exists). After a comparison is carried out, the compare editor opens in the editor area. In the compare editor, you can browse through all the differences and copy highlighted differences between the compared resources. You can save changes to resources that are made in the comparison editor. 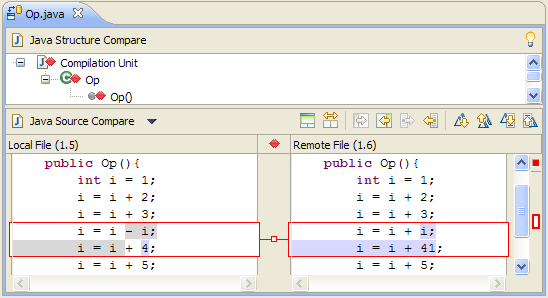 Compare editor allows for two kind of navigation: using differences or changes. A change is a portion of text that has been modified within the line, and the difference is a section of file consisting of one or more lines, and can contain many changes. Differences are marked with blue color, changes with red. Here is how the compare editor looks when you open it from a CVS Workspace synchronization. Basing on the content type the system determines which compare viewer should be used during a comparison. The button opens a drop down menu which allows to choose between other viewers registered for the same content type. If there is no alternative content viewer available the button is hidden. There are two conditions under which a three way compare will occur, both when using the Team version management support: when comparing a file that is in conflict, and when comparing a file being merged from a branch. In both cases, the system will determine a common ancestor in the repository to compare the conflict or merge against. This button determines the visibility of the third editor. By default, the ancestor pane is not visible. The compare editor can be toggled between performing a three way compare or a two way compare which ignores the common ancestor. Copies the entire contents of the file in the left pane into the file in the right pane, making the contents of the two files identical. Copies all the non-conflicting changes from the right pane into the left pane. Conflicting changes must be copied individually. Merges changes in two files by copying the highlighted change in the left pane into the highlighted fragment on the right. This will overwrite the highlighted fragment in the right pane. Does the opposite of the one just described. Highlights the next difference that is found between the compared resources. Highlights the previous difference that is found between the compared resources. Highlights the next change that is found between the compared resources. Highlights the previous change that is found between the compared resources.